The news of Elmo’s puppeteer, Kevin Clash, is distressing, unfortunate and scandalous for Sesame Street and its fans and followers. Despite the negative circumstances, we are reminded that God loves the sinner but not the sin. Elmo still represents happiness, fun, optimism and goodness. But there are haters and pessimists who will always find fault and promote perversion. We pray there is healing, repentence, forgiveness and righteousness in this sad Sesame Street situation. 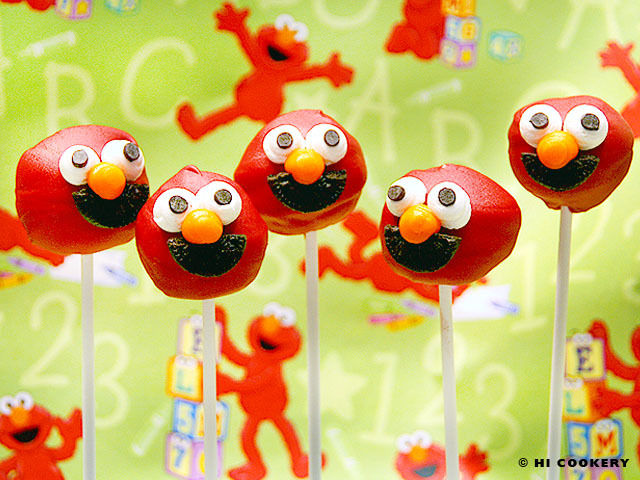 On a happier note, cheers to Elmo with cheesecake pops on his birthday! Elmo loves you and so does God! In a large bowl, crumble the cheesecake, crust and all, and mash together with a spoon or spatula until well blended. Roll into 1 ½ inch balls. Place on a cookie sheet lined with waxed paper. Refrigerate for at least an hour. In a microwave safe bowl or double boiler, melt the red candy and stir until smooth. 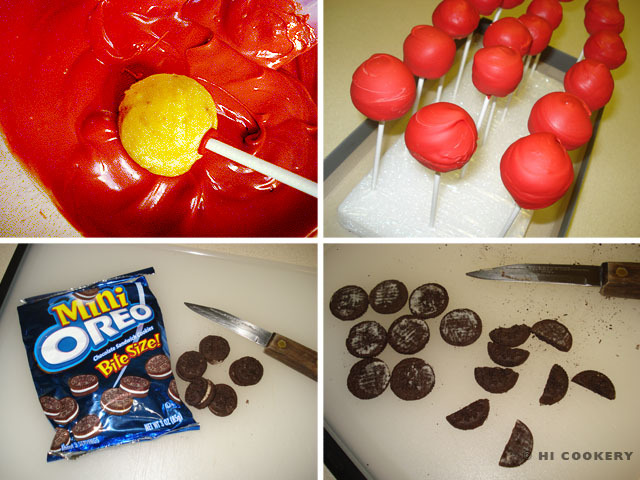 Dip one end of a lollipop stick into the red candy melts and then stick halfway into a cheesecake ball. Stand the pops in a styrofoam base and refrigerate to set the candy melts. 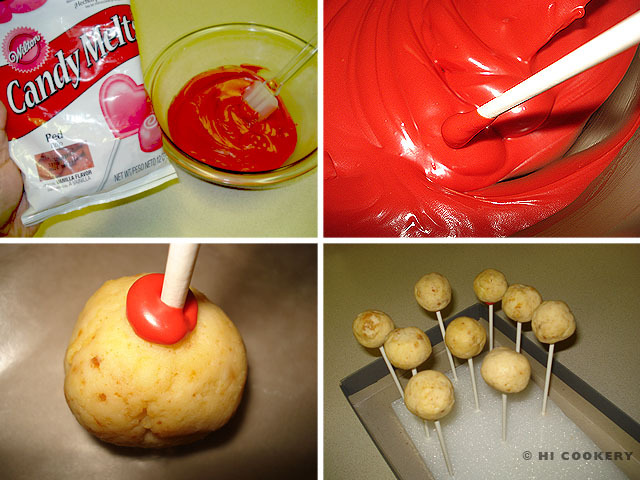 Quickly dip and coat the cheesecake balls in the red candy melts to cover the surface. Put them back on the styrofoam base and refrigerate to set. Meanwhile, twist apart a mini Oreo cookie and scrape off the white filling with a knife. Cut the cookie in half to form Elmo’s mouth. 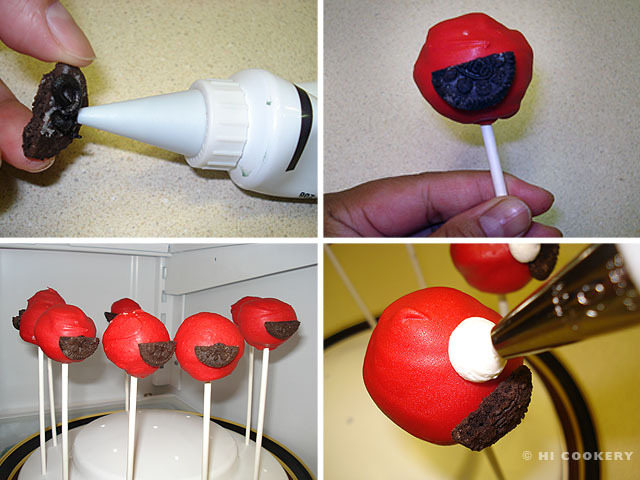 Use chocolate frosting from the tube to “glue” the mouth to a cheesecake pop. Continue assembling the rest of the mouths, refrigerating frequently. 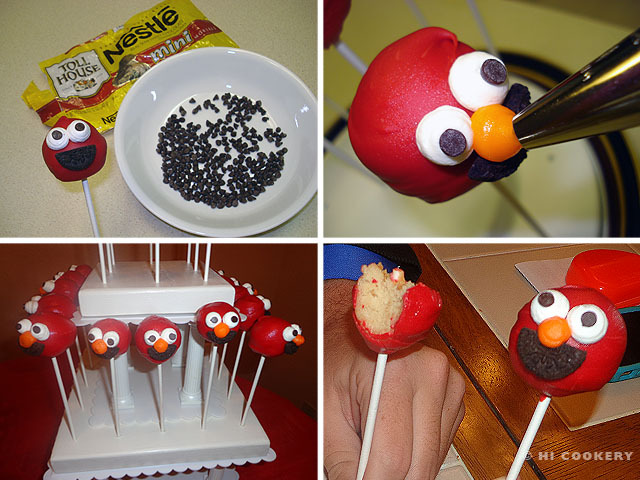 Use white frosting from the tube to pipe two round eyes. Place a mini chocolate chip into the eyeballs to make pupils. Pipe Elmo’s nose with the orange frosting from the tube. Refrigerate all to set. When ready to serve, place on a decorative lollipop or dessert stand. Cheesecake tends to hold its shape better than brownie or cake pops. 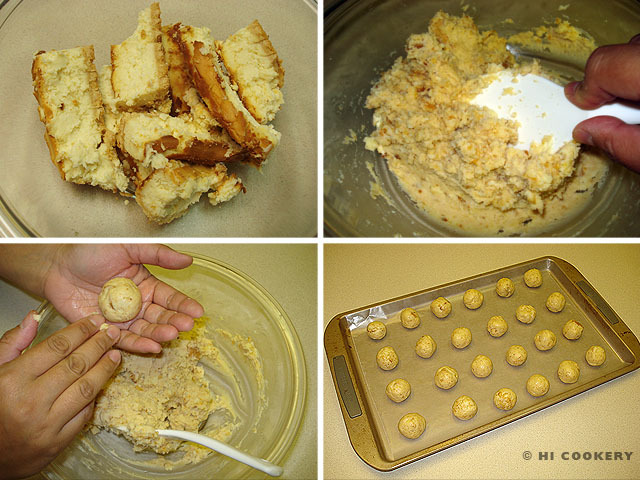 Keep the cheesecake balls cool at all times so they are firm and do not slide down the lollipop stick (see our Food Flops for an example).